Canon traditionally updates its SX budget compact superzoom line every August/September, and 2011 sees the release of the £199 Canon PowerShot SX150 IS. The SX130 IS replacement is a case of evolution over revolution – not a bad thing, considering the great features and value the SX130 offered. 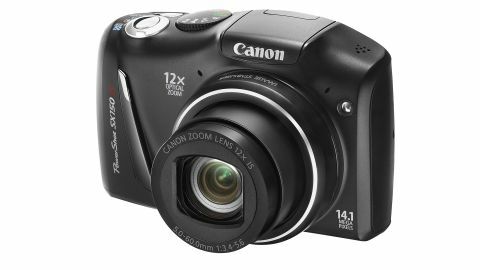 The Canon PowerShot SX150 IS features a 14.1MP CCD (a 2MP increase on the SX130's 12.1MP) and an image stabilised 5-60mm 12x wide-angle zoom that offers the same 28-336mm equivalent reach as its predecessor. The bright, but relatively low-res, 3-inch LCD from last year's model is also retained. There's been a slight tweak to the layout of the controls – specifically, the welcome introduction of a direct movie record button and a rejig of the mode dial. The optical image stabilisation gets an upgrade, too. The Canon PowerShot SX150's new Intelligent IS system is designed to identify the shooting situation and apply the most appropriate form of stabilisation from a range of seven different settings, including Tripod IS, Panning IS and Macro IS. However, the key appeal of the Canon PowerShot SX150 IS, apart from the incredible zoom range, is the level of manual control it offers. This super easy PowerShot is aimed at families and features all of the automatic features a casual snapper could want. These include Smart Auto and Easy modes that detect 32 scene types and optimise settings accordingly. However, for those who want to take their photography further, the Canon PowerShot SX150 IS includes the full complement of PASM semi-auto and manual shooting options. The camera doesn't enable you to record images in raw format - it's strictly JPEGs here - but otherwise there's enough DSLR-like functionality to consider this a serious alternative when you don't want to lug a 'grown up' camera around.